An island with a rich history and culture, Cyprus is an extremely popular Mediterranean tourist destination, in part due to its sun-kissed beaches, wonderful cuisine and wow-worthy sunsets. Arranging to send your parcel to Cyprus with DPD Local Online will ensure your parcel arrives exactly when you need it to, whether you’re arranging a courier delivery to the larger cities of Nicosia or Limassol; or even to Paphos - famed for being the mythical birthplace of Aphrodite, the Goddess of Love. Trusted by millions of senders across Europe, at DPD Local Online we have an experienced courier delivery network, which will ensure that booking postage to Cyprus is as straightforward as possible. Working within a budget is also easy with our economy and express parcel post. 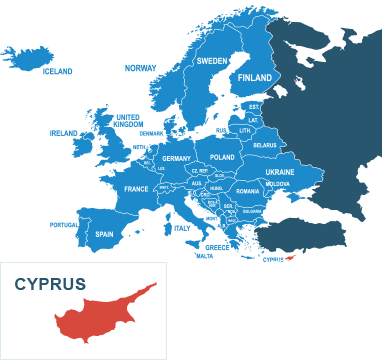 Just decide which service you’d like to use to send your parcel to Cyprus and we’ll do the rest. So, to book a parcel service you can trust, arrange your postage to Cyprus with DPD Local Online today. Do I need to deal with customs when sending from the UK to Cyprus? Cyprus is actually a member state of the European Union, which means you won’t need to carry out customs duties when shipping to Cyprus from the UK. One less thing to worry about! How much does it cost to send a parcel from the UK to Cyprus? Postage to Cyprus costs as little as £34.75 if you book with DPDLocal-Online. When you book with us, you can compare our offers, inclusive services and delivery speed. That means you can send cheap parcels the way you want to with zero hassle. How should I address my parcel for delivery to Cyprus? Addressing to Cyprus is fairly straightforward. Just add the addressee name on the top line of the address, followed by the house number and street name, then the postcode and region, and finally the country name “CYPRUS” in block capitals. If you’re not too sure what that looks like, not to worry. The Universal Postal Union has put together a useful addressing guide with some examples that you can check out to make posting to Cyprus even easier. You can see the full list here, as well as our own list of items prohibited.